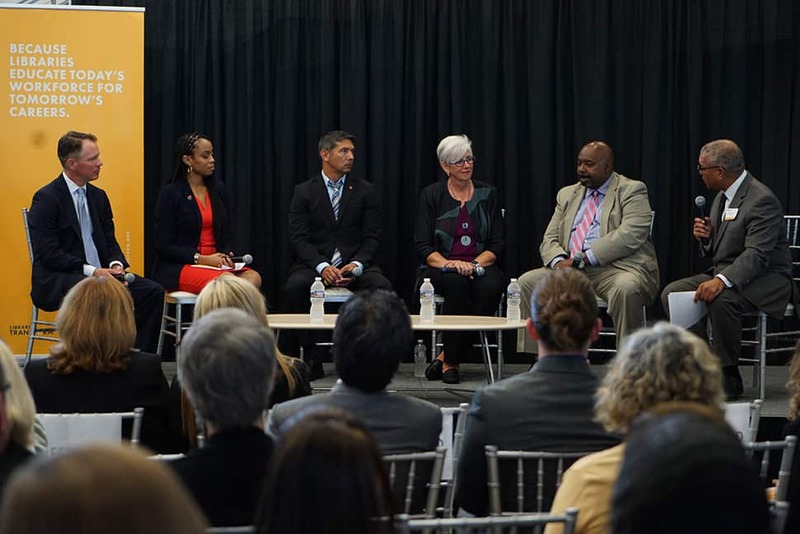 The “Libraries Educate Today's Workforce for Tomorrow's Careers” panel held on August 9 in Cleveland. 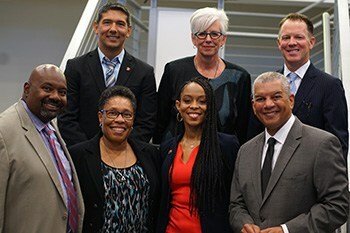 From left: Ryan Burgess, director of the Governor's Office of Workforce Transformation; Shontel Brown, Cuyahoga County Council representative for district 9; Mick Munoz, a former Marine and Ohio library patron; Denise Reading, CEO of GetWorkerFIT; and Jeff Patterson, CEO of Cuyahoga Metropolitan Housing Authority; and moderator Russ Mitchell, WKYC-TV anchor and managing editor. A five-person panel of Ohio community leaders explored employment issues August 9 during “Libraries Educate Today’s Workforce for Tomorrow’s Careers,” an event organized by four Ohio library partners and the American Library Association (ALA). The discussion—which focused on libraries as an essential component in creating, sustaining, and retaining a viable workforce—brought together leaders from all levels of government and community nonprofits. 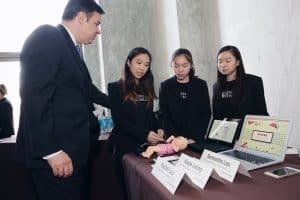 The program took place at Rakuten OverDrive headquarters in Cleveland and was cosponsored by Cleveland Public Library, Cuyahoga County Public Library, Ohio Library Council, and ALA. It is the first in an upcoming series of local events organized by ALA and hosted in collaboration with libraries and library businesses across the country. US Rep. Marcia Fudge (D-Ohio) opened the event by identifying one of the biggest employment issues facing her constituents. 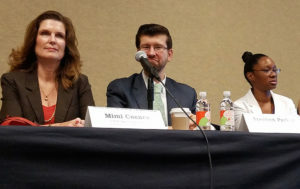 Back row, from left: Mick Munoz, Denise Reading, and Ryan Burgess. Front row, from left: Jeff Patterson, US Rep. Marcia Fudge, Shontel Brown, and Russ Mitchell. The panel discussion, which was moderated by WKYC-TV anchor and Managing Editor Russ Mitchell, included Ryan Burgess, director of the Governor’s Office of Workforce Transformation; Shontel Brown, Cuyahoga County council representative for district 9; Jeff Patterson, CEO of Cuyahoga Metropolitan Housing Authority; Denise Reading, CEO of GetWorkerFIT; and Mick Munoz, a former Marine and Ohio library patron. Burgess noted that libraries contribute the necessary infrastructure to accommodate the programs Ohio is working to make available. He also talked about the importance of bringing people together so they don’t have to face the job market alone. 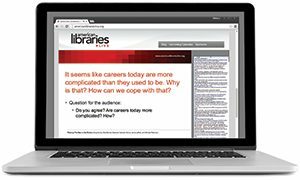 The program went beyond offering insights into the work libraries are doing with partners. ALA Manager of Public Policy Megan Ortegon emphasized that the goal of events like these is not only to talk about the work of libraries but to engage with elected officials and keep libraries in the public eye. “ALA’s goal is to generate more opportunities by prompting community leaders and elected officials to think about libraries as key partners,” said Ortegon, a former congressional staffer. The hour-long event encouraged panelists to look to the future. 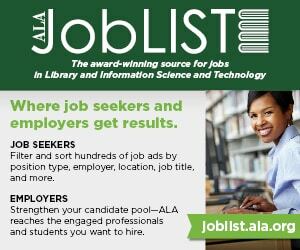 “We must continue to leverage libraries in order to ready our community members for the growing and changing job market,” said Brown, noting that the work of libraries to help people to find their career paths is vital to Ohio. After the panel, video comments from US Sen. Rob Portman (R-Ohio) emphasized the instrumental role of libraries in workforce development. The event concluded with remarks from ALA President Loida Garcia-Febo. For information about upcoming events, contact Megan Ortegon. EMILY WAGNER is assistant director of knowledge management and communications for ALA’s Washington Office.